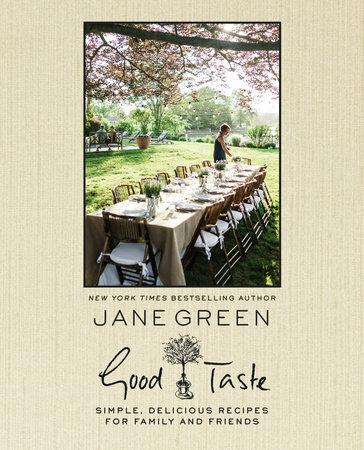 Summary: A lush and gorgeous guide to all things food and entertaining from Jane Green, New York Times bestselling author of Jemima J, The Beach House, and Falling. It's been awhile since I've featured any cookbooks on Booking Mama. Truth be told, it's not that I don't still enjoy sitting down and looking through a cookbook for new recipes. Rather, it's that I haven't been cooking all that much lately. And when I do, our family is so rushed for time that I'm usually throwing together a tried but true recipe. Maybe it's because I haven't really been searching out new recipes, but I really enjoyed looking through Jane Green's new cookbook GOOD TASTE: SIMPLE, DELICIOUS RECIPES FOR FAMILY AND FRIENDS. Yes -- that Jane Green, author of MR. MAYBE, JEMIMA J, and more! I am a huge fan of Ms. Green's, and I'm so not surprised that has written a cookbook about entertaining. I've always sensed thought her writing that she had a beautiful sense of style, and she's even included a few recipes in past books. 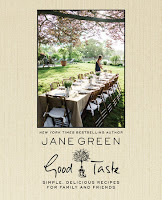 GOOD TASTE is a lovely cookbook that I'm certain fans of Ms. Green will enjoy. That's not to say that the cookbook won't appeal to other foodies, but I know I enjoyed "getting to know" Ms. Green through the stories she shared in this book. The recipes are eclectic and, for the most part, pretty healthy. There are a few vegan recipes and many low-carb ones, but the desserts are true treats -- none of that healthy, low-fat dessert talk. The cookbook is divided into three sections -- Beginnings, Middles, and Endings; however, the Beginnings section isn't what you'd necessarily think. There aren't a ton of appetizer recipes because Ms. Green is from England and they just don't eat apps like Americans do. There is, however, a lot of soup recipes that sound amazing. Most are relatively simple to make, but they do have some unique ingredients and flavors. I was especially impressed with the Sweet Corn and Chili Soup. It is so easy and sounds amazing! My mouth was also watering with her recipe for a Spinach and Gruyere Crustless Tart. The Middles chapter is full of mouth-watering recipes for main dishes. I thought her rib recipe sounded both easy and delicious, and there were a couple of chicken dishes that sounded tempting. I loved the idea behind her Slow-Braised Onion Chicken. It honestly couldn't be easier. I just might have to try that one this week! Finally, the Endings section had a wonderful assortment of desserts. There were a few chocolate based recipes that will appeal to chocolate lovers (not me! ), but I am eager to make her Pavlova and Chess Tart. All of the desserts were fairly simple and just a little different from normal dessert fare. What made this cookbook so special, though, were the special touches. The color photographs of the recipes and Ms. Green's decorations were absolutely gorgeous. Seriously, you could look at this cookbook just for the pictures. And I loved Ms. Green's background stories that were included for each recipe. Sometimes, she explained the history of the recipe or even a charming story about a time she served the dish. Ever since I participated in a call with Ms. Green a few years ago, I've always sensed that I'd love just hanging out with her. GOOD TASTE definitely contributed to that feeling. Ms. Green seems like the hostess with the mostest, for sure! I'm not cooking much either but still enjoy looking through, and drooling over, cookbooks. This sounds like a good one. Oh my gosh! I don't know what I was thinking! Thanks -- I made the correction!